It is pretty obvious that when you grill a lot your grill gets pretty dirty. This is especially true when you use your charcoal grill as a smoker. 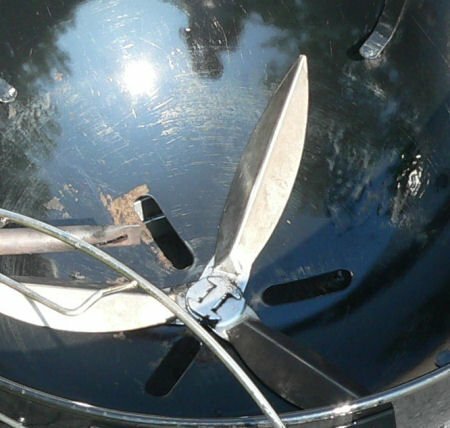 Smoking in your grill leaves smoke residue all over the inside of your kettle. 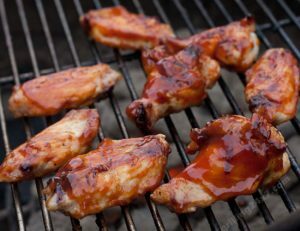 When BBQ sauce, apple cider, fats and grease all collect at the bottom of your kettle the air vents can get stuck or be very difficult to use. 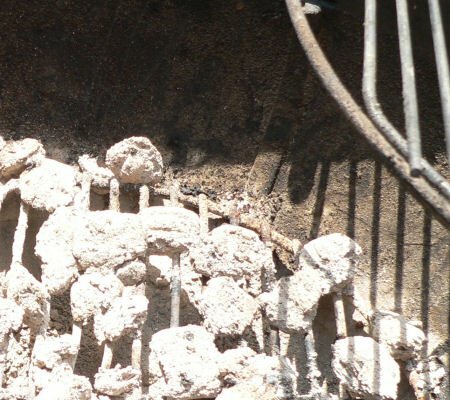 It is essential to clean out your grill once a year or at least once every other year depending on how much you grill and smoke. 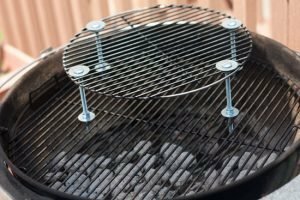 Note: If you are feeling a little lazy, or crunched for time, check out this post on cleaning a charcoal grill with a pressure washer. It saves some time! This is what the grill looked like before the cleaning. The first step is to take apart your grill. 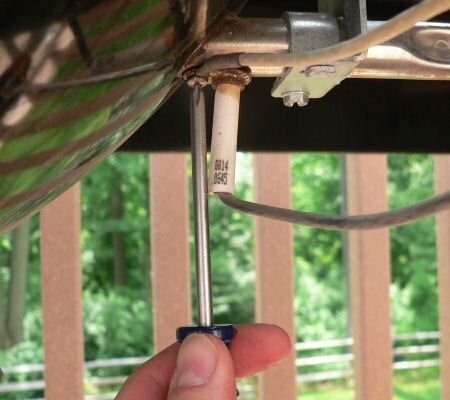 For the Weber Performer you need to start by taking apart the propane ignition system. 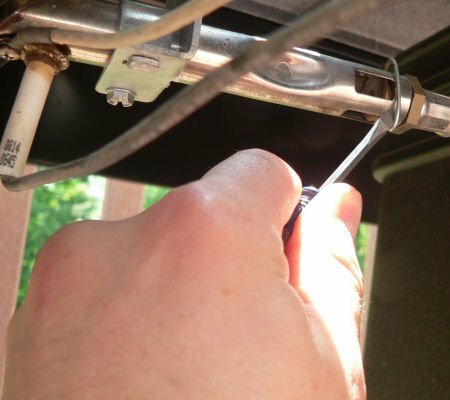 You need to unscrew the spark ignition as well as the propane gas line that feeds into the charcoal kettle. The last step in the disassembly of your grill is to simply unscrew the kettle from the sides of the workstation. 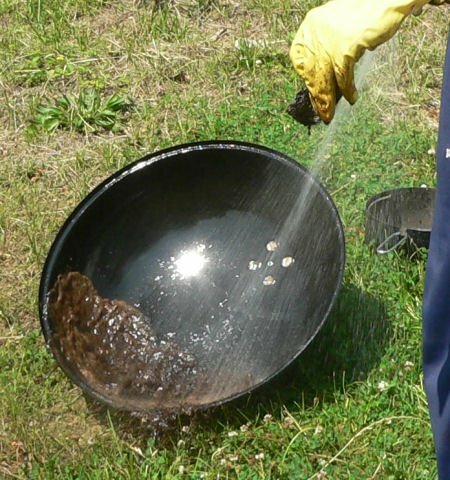 If you’ve ever worked with oven cleaner before you’ll know that it not only burns your skin and smells awful but it can also do some damage to your lawn. Find a nice open area that has some grass that you really don’t care about. 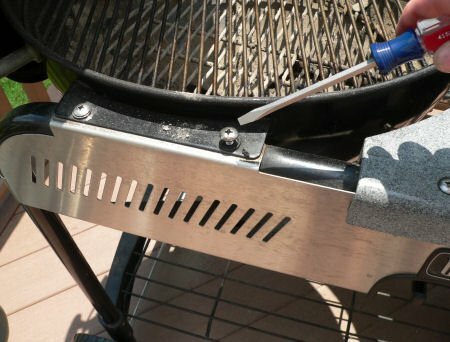 Gather all of your supplies and you’re ready to clean your grill. Spray a nice heavy coat of oven cleaner all over the interior of your kettle. Do this to the top and bottom of your kettle. 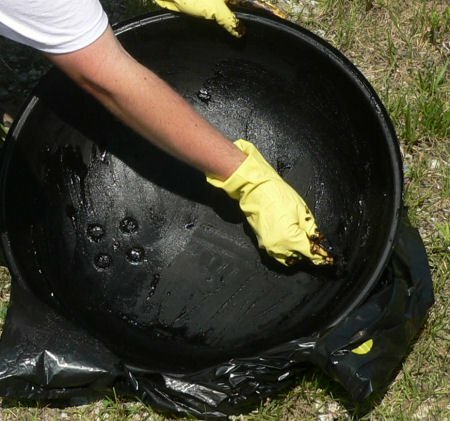 Once the spray starts to bubble a bit, move the kettle into a black trash bag. 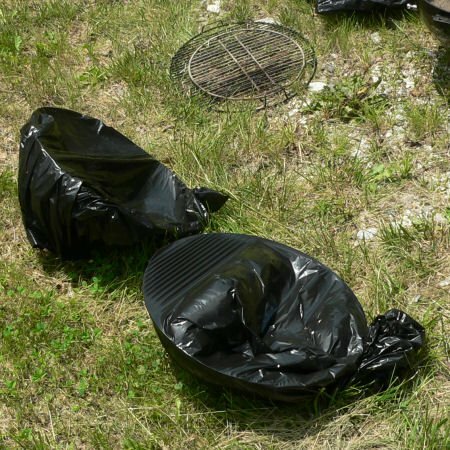 If you do this on a nice hot sunny day the black bag will help create a hot enviornment for the sodium hydroxide to get to work on the grease and grime in your grill. 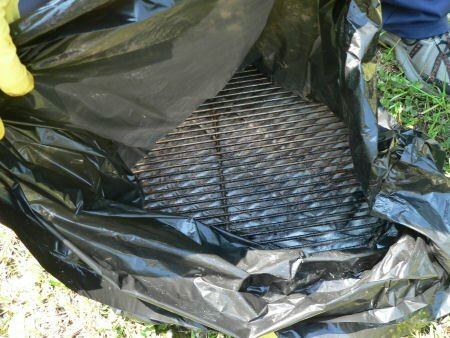 Give your grates a nice heavy coating of oven cleaner and place them in a bag as well. Now comes the easy part – open up a beer and relax for about an hour. You want the oven cleaner to have a chance to break down all the funk that has accumulated over the course of the year. Now comes the hard part. Remove the kettle from the trash bag and slighly wet a brillow pad. Scrub all around the interior of the grill. 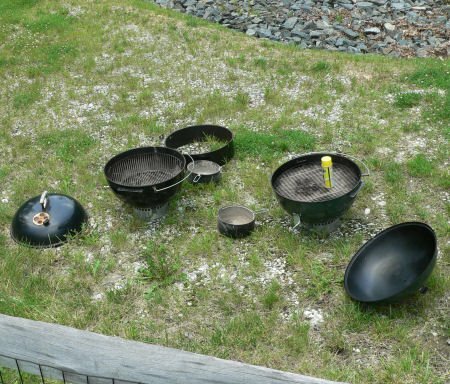 Depending on how dirty your grill is this can become quite a task. Be sure that you are using rubber gloves or latex gloves or you can get badly burned by the sodium hydroxide in the oven cleaner. If you get some on your skin wash it off immediately. You will be fine as long as the cleaner doesn’t come in contact with your skin for more than a few minutes. 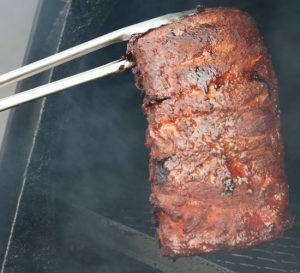 After you have used the brillow pad on the grill, hose off the kettle to remove the funk. This will allow you to see what you’ve missed. A lot of grease and residue will come off. You will probably need to scrub a little bit more. 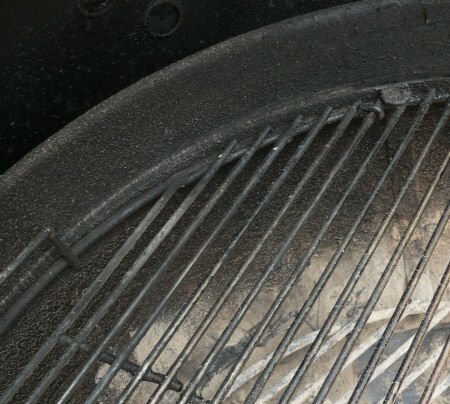 After the inside of the kettle is clean use a brillow pad (not oven cleaner) on the outside of your grill. Don’t press too hard or you may scratch things up. However, the brillow pad works well on the outside of the kettle as well. Rinse the exterior of the kettle as well. Repeat this process for the bottom of the kettle as well as the grates and then allow the grill to dry. Wow – does that grill shine or what!?! I also like to apply some WD40 to the air vents to keep things moving smoothly. When your grill has dried, reassemble the kettle back to the workstation. I like to leave the grill sit open for at least 6-8 hours to really let things air out before cooking. Also, before the first meal is cooked on the grill I will light a really hot fire and close the lid with all vents open to allow any excess soaps, or oven cleaner to burn off. This step may not be necessary, especially with all of the rinsing that I perform, but it never hurts. Now I can use my clean grill for the next year! This actually really works! I have on of the bigger Webber charcoal grills and my garbage bag wasn’t big though so I stretched the bag a little then draped remai Ser over opening and placed 2×4’s across and let it do the magic. It looks almost new! I followed this exactly and was very pleased with the results. A like New Webber grill! 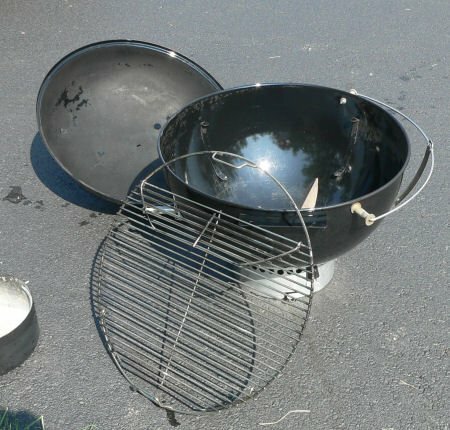 I’ve used this method to clean my Weber. I even used Wal-Mart’s brand oven cleaner. I was really impressed. The combination of placing items in garbage bags and the hot Florida sun left everything almost new.